The temple is in Sheesham Wood except for the base where idols are to be placed and the ceiling where dome is placed which is in premium quality plywood. 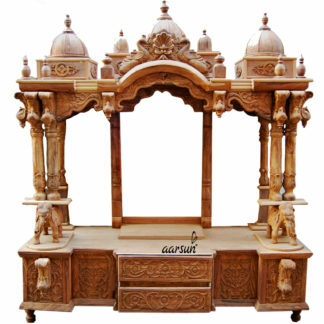 The temple is made up of premium quality sheesham wood with beautiful carving.The temple is mounted on four curve piers and above that there are drawers at the front which have beautiful floral carving.Above that there are two beautifully carved elephant which herald the deity in salutation mode.There are two pillars at the the front or at the main place of the deity with plywood finish.Above the main garbagriha there is peacock design at the mehraab area with holy word “RAM”written over there. 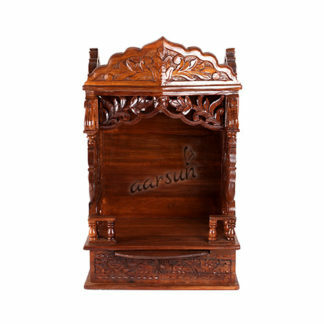 The temple is best suitable for home and office purpose.As we are the manufacturers so customization available as per the need of the need of the customer.We provide free shipping across India.